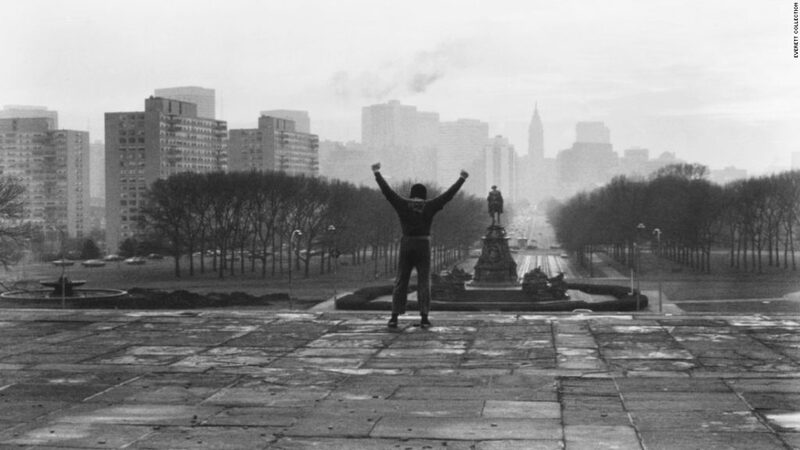 A truly notable aspect of the original Rocky is that there is essentially zero background given for any character. A quote of advice his dad gave him and a brief glance at picture on his mirror of himself as a child is it for Rocky himself. The fact Stallone was able to make people love this character based entirely on what happens in that one film and not on some sentimental life circumstance, like being an orphan, is amazing. 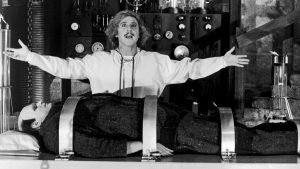 With seven subsequent stories, each movie serves as its own background for the next and that is why the franchise has been so successful over four decades. In this respect, Creed II is such an avalanche of sequel (I can’t think of a better noun than that) I needed two passes to take it all in. I didn’t mind, of corse, as I watch all Rocky movies over and over and had zero doubt I would want to see this one at least twice in the theater. The reason I allude to above that I needed two viewings is what makes this movie special. 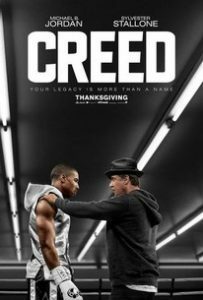 The first viewing I was so consumed with the continuation of the Rocky IV story that I had a hard time assimilating the Creed narrative. Rocky IV, while not the best of these films, is the most re-watchable to me and is exploding with personality. You can’t have an all-time American sports movie icon vs. a roided-up Russian in the 80s with death on the line and not get a movie to remember. And that fight is the best sporting event in film to me. So in every scene in Creed II with any combination of Drago and Rocky, I was locked in like a fat guy watching the dessert table at a church potluck. As such, everything that happens with Donnie and Bianca and even Rocky’s story arc from Creed needed a second viewing to truly appreciate. With substantial background from two movies to consider, my brain just couldn’t take it all in. And as I watched it a second time in the theater back in November it was then I realized this movie is truly two sequels in one and that I, personally, needed to see it twice: once with “Rocky IV Part 2” eyes and once with “Creed I Part 2” eyes. It is through this lens I will be giving this review, which is packed with spoilers. As I said in my Rocky rankings back in November, I deeply and significantly appreciated that in Creed the producers masterfully blended an old story with a new one, giving fresh life and a younger audience to one of the great stories we have in America cinema. I didn’t assume that Creed would pay meaningful homage to Rocky. I knew he was in it but I assumed this new Michael B. Jordan character would be the dominant focus and the Rocky universe would play a minor role. That didn’t happen. Stallone’s Rocky was prominent and major and minor allusions to the previous six movies were everywhere. This movie does the same, but on steroids. If you loved Rocky IV, you can’t help but adore the bulk of this movie. It’s literally Apollo Creed’s son vs. Ivan Drago’s son in a boxing ring. That as a premise is epic in and of itself, and I know that word is overused these days so I use it sparingly and accurately here. But Rocky’s history with Drago is even more intense. The moment in the trailer when Rocky comes face-to-face with Drago in the ring for a Donnie/Viktor bout flooded my soul with joy and is without question made me want to see this move more than any other trailer has for any other movie ever. My favorite moment in the actual movie is when Drago stops by the restaurant to chat with Rocky, at which point I nearly passed out from all of the oxygen leaving my head causing my heart to beat a gazillion miles a hour. This whole scene immediately became an unforgettable part of Rocky lore. And the crowning jewel of that scene is when Drago opens up his dialogue by noticing that there are no pictures of his fight with Rocky on the wall, as there are of all of Rocky’s other legendary victories. Rocky replies, “No, there ain’t nothing from that in here.”. Later, Rocky is trying to talk Donnie out of taking the Drago fight and he says, “He broke things in me that ain’t never been fixed.” Both of those quotes not only caused me to feel deep emotion, they both do something that I profoundly appreciate: they make me love Rocky IV even more. Knowing the impact of the events of that fight for Rocky 33 years later only serves to make those events even more entertaining. This is something I am hoping these extra Harry Potter plays and movies would do but have not yet[1. The Fantastic Beasts movies are still good, for what it’s worth.]. Something this movie does that Rocky IV didn’t do is to give Drago and his son actual character. Drago was sensational as the villain in Rocky IV in one snese, but he was pretty flat and cartoony (a legit critique I made for Rocky IV in general in my last articles) and only had like 7 lines, half of which aren’t in English. [2.Because apparently his tongue didn’t come through customs.] Drago and Vicktor by contrast are not simple characters in this installment and they even make you feel for them at the end. I was thrilled to see Viktor and his father as humans, and not just “Bad Russian Men.” Even if the plot to achieve that was a tad cheesy and the standard “They are messed up because the mother/wife left them” trope. The moment at the climax where you think Drago is going to walk out as Viktor’s mother did, but instead throws in the towel, is tearjerking. And while it was quite different in key ways, that simple action also took Rocky fans back to IV. Lastly I will add that even though the Rocky references (both subtle and unmistakable) are mainly from IV, there are plenty of plot points and dialogue that recall the other movies. A huge one is the fact that Adonis fights and loses and then wins the rematch, which has echoes of Rocky III. A more obvious one that I loved with my whole heart was when Donnie was extremely nervous about proposing and asked Rocky what he said to Adrian. Rocky quotes himself from II directly: “I asked her if she wouldn’t mind marrying me too much,” which is classic Rocky vernacular. I do think they missed a fantastic moment to have Rocky recall that he asked her what she was “doing the next 40 or 50 years” prior to that, but maybe they felt it would have made the scene less poignant. As a Rocky fan, I feel Rocky’s entire marriage proposal to Adrian would have been worth quoting. Not to be diminished by the Rocky IV hoopla is how beautifully and satisfying Donnie and Bianca’s narrative is advanced. After one viewing I wasn’t sure how I felt about all of these plot points, but after I had a chance to focus on them my second viewing (instead of the ‘other’ sequel), I lauded them. First, Donnie being nervous about proposing allowed the callback to Rocky II, but it was also not lost on me that this cocky, smooth-talking, champion boxer was overwhelmed and flummoxed by the moment and needed help. This was a touching scene and made Donnie a relatable everyman for a moment, and hence, a better character. This kind of humility will always endear me. And the storytelling wrenches the heart even more when this young couple has to deal with the possibility that their daughter inherited hearing loss from the mother. The moment when Bianca sees her husband break down when their daughter doesn’t respond to the test was some of the finest acting I saw in 2018. One of my brothers (the same one who allegedly tears up at the end of Rocky II, but I still will not name) texted me after he saw the movie to say that he shed tears at several moments but this was the toughest one. For my money the most emotional moment was also on his list: Donnie visiting Apollo’s grave at the end. I wept for sure. A close second is also at the very end when Rocky visits Robert and his grandson he doesn’t know. It saddened me that they did not include Robert in Creed but for one passing comment, but I assumed it was because Sage Stallone had recently died and it would have been awkward for real life Sly Stallone for his fictional son (once played by Sage) to be included. Why else would Robert not show up when Rocky had cancer? As they kept mentioning him in this sequel, it was killing me that Rocky was estranged from him and his only grandchild. Rocky was a family man before Adrian died and it is almost perverse for him be going through life with only a surrogate son in Donnie. So when he predictably travels to Canada in the very last scene, I beamed like a new parent at a newborn child. I also nearly jumped out of my skin when it was revealed that Robert was again portrayed by Milo Ventimiglia, reprising that role from Balboa. My wife will testify that as Rocky got close to the house, I kept nudging her and whispering “Will it be Milo? Will it be Jack?” (His name on This Is Us) to the point of being annoying. Having Milo and Michael B. Jordan in the same movie should be illegal it’s so good. I do not want to imply the movie was fragmented at all. The writing and direction blended the two sequels magnificently, like two lines that run so closely together they are distinct yet clearly connected, and that touch at key points. Perhaps the best illustration of this is how both Donnie and Rocky cannot escape the demons of the 1985 Creed-Drago fight and specifically Apollo’s death: Rocky for not throwing the towel and Donnie for never knowing his father. They produced one sequel to two classic movies so well so that I am tempted to put this chapter in the Rocky saga near the top of the rankings, just behind the original. It is that good. The heart of Rocky and the spirit of Creed are interwoven together like magic and I am excited that now it is on Blu-Ray and DVD, I can watch it as many times as I want. I was one year old when this was released and part of me hates it that I didn’t get to experience the hype of knowing this movie was coming after what a rousing success the original was. Before the last two movies were made, Rocky fans could pretty well be divided into two groups. While everyone hated 5, there were those who preferred 1 and 2 and those who preferred 3 and 4. There really is a stark transformation between the two pairs of movies. In the latter two, Rocky became (to quote Mick in III) “civilized”; Adrian became outspoken. Before that, you had two meek people in very meek circumstances. In Part 2 they are figuring each other out as newlyweds in the midst of the normal array of trials that life throws at you. From financial issues, to getting laid off, to pregnancy scares, we get to see the Balboas as real characters. We all can relate to something that happens in the first two acts of this film. To me the strength of the first two movies is the character building and then they used the rest of the series to take chances with character changes and with plot direction. And not to be overlooked is that Mick’s best moment to me in the series is the speech he gives Rocky in the chapel when Rocky is consumed by Adrian’s hospitalization. The way he affirms him in his unique Mick way is special, and it is this speech that Rocky goes back to in V when he’s on the ground while fighting Tommy. Then we get the Adrian “Win” quote and it feels like the fight is just a footnote after the rollercoaster of emotion this movie takes us on. But the fight is spectacular and emotionally consuming. That cannot be overstated. I have almost never seen any of my brothers cry, but I know of one of them who tears up pretty good at the end of this movie. The truth? I seen you beat that man like I ain’t never seen no man get beat before. And the man kept coming after you. Now we don’t need that kind of man in our lives. You know I was wondering, what do you think you’re doing the next 40 or 50 years? 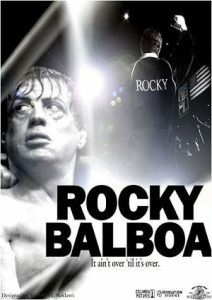 There is no doubt that even though this isn’t Stallone’s brainchild this is a Rocky movie and continues the story. Just with a necessary new focus. And what a Rocky chapter it turned out to be. I was pumped about this movie but as I’ve heard mega fans of different franchises express numerous times in anticipation of sequels, prequels, reboots and the like, I was extremely cautious. This could’ve been a disaster. It was the opposite. I give Coogler all the credit in the world for bringing this franchise into the modern era in a way that 69-year old Stallone knew he could not, but doing it without losing what made the Rocky story so special. Explicit and obscure references to the prior films are all over the script and scenery (including “Gonna Fly Now” and chasing the chicken). Even the heart of Philly is at the story’s core. My favorite thing about this movie is the balance of screen time between Rocky and Adonis. Neither upstages the other and that is exactly how it should be. Rocky is the star of these films. Stallone created this timeless, inspirational world centered around the greatest character of all time. But Donnie is getting the torch passed to him in a fascinating story about Apollo’s illegitimate child figuring out who he is as a fighter and as a person. Michael B. Jordan is a sensational actor, whom I gush about quite often. Either man dominating the fore would have made for a lesser movie. They are in tandem, not in competition. Their chemistry lights up the big screen. The moment where Donnie shows up to Rocky’s restaurant and knows things about him and Apollo is one of those awesome entertainment moments where the first time I watched I stopped breathing I was so captivated. The theater could have been on fire and I would have not noticed. The contrast in Adonis as the young, modern, west coast professional and Rocky as the middle-class inner-city old man (highlighted by Adonis explaining to a bewildered Rocky that his workout regime was in the “Cloud”) is hilarious. And they’re becoming fast family and showing the world exactly what synergy is does my Rocky fan heart good. There is nothing they could have done to make this film more relevant to past and current generations. Coogler built a beautiful bridge with this work. Lastly I add that in a game vs. Portland in 1992 (the year he retired) Larry Bird went off on National TV for 49 points, 14 rebounds, 12 assists in 54 minutes and on 19-35 shooting, including a clutch, off-balance three that sent the game into overtime. While playing on a destroyed back, a bum thigh and a messed up Achilles. THAT was Stallone in this movie. In the twilight of his career, he gives a throwback performance for the ages. Since 1976 this man has been bringing the emotion, making me as a guy feel deeply. I don’t know that he has ever been better. Adonis: I can train at your house. Rocky: No, I don’t know. Nobody’s been to my house in a long time. You might not be comfortable there. Adonis: What? You walk around naked? Rocky: You better not walk around naked either! If you asked me which of these films I would most want to watch, I would say IV or the original. Or maybe Creed. 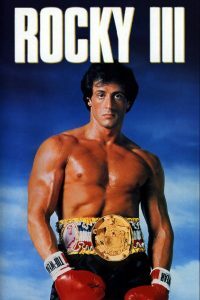 But if we are ranking them based more on merit than a feeling, I have to say this is the second best Rocky movie. The reasons are legion. Mr. T gave the performance of his life as the volatile, trash-talking Chicago brawler, Clubber Lang, who was different enough from Apollo simply in how scary he was. Mick’s death was a poignant punch in the stomach, complete with Rocky’s immediate meltdown and subsequent introspective reaction to it, as the “Mick” music plays behind him. Star Wars and The Sixth Sense may have the best plot twists of all time, but Apollo becoming Rocky’s manager has to be up there right behind them. The series excelled at keeping Rocky the underdog, which is hard to do with a man who was on top so often. Watching Rocky get manhandled by the toughest of 80s icons while his manager was dying got the job done. It’s just a superbly written, cast, and executed movie. Not only was Apollo’s return a stunning development, the story arc of him helping Rocky to get his edge back before the rematch with Clubber really deepened the emotional impact of the movie. By taking him to his old training stomping grounds in L.A., the whole tone of the movie is altered. The Rocky series has race and cultural differences all over it (every single ring fight is between two different ethnicities), but it never ever was about that. This is as close as they came to shouting, “Hey everybody! Apollo is black! Rocky is white!” And it was not superfluous at all. What Apollo did was genius and it worked. It wasn’t preachy in the slightest but it did remind me that we can learn from people and cultures who are different than us. Rocky had to change to beat Clubber. Apollo facilitated it. As stated above, Adrian was much more understated in the first two movies than in the next three. She disagreed with Rocky in Part 2, but she didn’t really argue with him. This movie debuted Argumentative Adrian. And it was magnificent. Every movie from this one until V featured a Rocky-Adrian face-off that I honestly want for my real-life marriage. The scene on the beach where she gets him to admit that he’s scared is brutally honest, raw and transparent. The cards were on the table. In his words, she breaks him down. All to help him, which it does. It’s one of the two or three best scenes in all seven movies to me. And let us never forget that this movie started and ended with the greatest sports inspirational song of all time in “Eye of the Tiger” AND gave us a whole scene cameo of Hulk Hogan. Those two things are major bonus points. Winner and still champ, the original Rocky is nearly impossible to dethrone. And it’s not just because it’s the genesis of the character and story. It’s because its story and character development reign supreme by any criteria. The Oscar nominations and wins speak for themselves. And seeing as how much Stallone had going against him to make and star in this movie, we know every accolade was earned. After over 3,000 words in this two-part article, I probably have exhausted nearly all of the good adjectives English has to offer. But there is still one left: Greatest. That is what this movie is. To today’s culture, this movie is slow in developing. But to people like me who grew up with it and sometimes want it to “take me back,” we know just how special something slowly prepared can be. That is this movie. It’s a simple story. A down-on-his-luck boxer, who proclaims himself a bum (a term that comes to mean something throughout the series), falls for a very shy girl he sees at a local business. They have an extremely awkward first date. But she comes to trust him. He in turn bares his soul to her in subtle but profound ways. If you are not paying attention you can easily miss how important it is when Rocky confesses to her that Apollo’s insults did bother him, after laughing them off in public. That is more significant than the boxing is to me, especially in the series beginning. Rocky and Adrian are just so lovable and humble. In a word, they are human. And what makes their relationship enthralling is that they fill each other’s gaps.[1. Several women in my church claim Rocky is a chick flick.]. Rocky as the title character is as good as it gets. He is a tough guy from the streets with minimal education, but he’s not simplistic. He is a hero in the little things in life, like knowing people in the neighborhood, looking out for children and hobos, and simply not thinking he’s better than he is. He is the most unassuming person you can meet. Everything Rocky becomes later in the series is built on this foundation. And it’s perfect. You can even see how he comes full circle as Rocky in Balboa and Creed is much closer to this version than in III or IV (V is basically the transition back after they lose all of their possessions). It’s remarkably endearing. Far more than any actor in any other role, Sylvester Stallone is Rocky. There is no one in fiction to me like him. I can’t get enough of him. They could make 100 of these movies and if Rocky’s in it, I’m there on opening weekend. The love story and central character development eventually cede to what the movie supposedly is about: the main character getting an unprecedented shot at the boxing title from the champ himself, flawlessly portrayed for four movies by Carl Weathers. 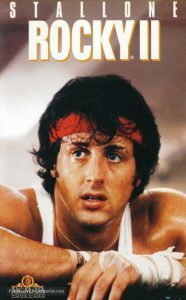 Yet even before the fight, Rocky captivates us with his character. Very few images are as iconic to me in this series, among the two dozen that are, as Rocky pounding the frozen beef at Paulie’s job. And then there is the defining moment in the whole series to me, just before the final fight. Rocky can’t sleep and he confesses to Adrian that he doesn’t care about winning as much as “going the distance”. Because no one had gone the distance with Creed. That is Rocky in a quote. It is no coincidence that in half of the movies that end with a ring fight, the main character does not win[2. In Balboa, he doesn’t even stick around to find out if he won and the crowd cheered for him as if he did win.]. Because it’s not about winning. Rocky, even up to the Creed chapter, is about heart, about chin, about character-building and storytelling. The means will always be more important than the end. I’m not one to bash the current generation like a crotchety old man, but this is a timeless truth everyone needs to learn. So that’s why it is number one. They have given us phenomenal subsequent chapters to this story. But ain’t nothing like the original. It can’t be replicated. And it can’t be beaten. I don’t see no crowd around you neither. Thoughts, reactions, complaints and comments are welcomed below! “Why do you wanna fight? Growing up without Harry Potter, Lord of the Rings and with just a pedestrian affection for Star Wars (I thought I was a big fan until I went to Welch College and met people who watched the prequels like 15 times on opening weekend), Rocky was as close as my brothers and I got to the geek level of fandom. We watched the movies over and over. We owned boxing gloves and pretended to be the characters. We listened to the soundtracks nonstop. So I definitely have an opinion on the movies and how they rank against each other, though I would be quick to add that when people ask me my favorite movie of all time, I say “Rocky” and mean the whole story and not just the 1976 original. It is a saga to me divided up seven ways, with tomorrow debuting the 8th piece of this perfect American story pie. Nevertheless, when ranking them I do not want to do the typical American thing and presume that the opinion of one 40-year old man is “definitive”. This is absolutely up for debate. Yet I want to write about how I consider them, from least great to the individual movie GOAT. 7. Balboa—A visually spectacular fight with plenty of drama. The fact that it brings up the rear is a testimony to how legendary the Rocky fights are. 6. Creed—Thanks to cinematic advances it is more realistic than any other fight in the series. Yet the competition is just too fierce. The defining moment in this one isn’t as special to me as most of the others. Perhaps because Adonis, while a brilliant character, isn’t quite Rocky. 5. Rocky V—People did not like this fight being a street fight instead of a ring fight. But I give it huge props for not being derivative and for the quotes that it gave us (see below). 4. Rocky III—Would be higher but it is literally the only ultimate fight in the entire Rocky catalog that doesn’t go the distance, which feels significant given the heart of these films. But Rocky trash-talking Clubber as he whips him is epic. 3. Rocky—Rocky with a stunning knockdown early on, after Apollo had never been knocked down…the look on Apollo’s face when Rocky gets up in the 14th round and begs for more…Rocky going after the ribs in the 15th….there are no English words for emotion to describe it. Of note: Rocky won an Oscar for Best Film Editing for this fight. They put on the 15th round makeup on Stallone and Weathers and shot the fight in reverse as they took the makeup off. 2. Rocky II—I’ve watched this fight at least 30 times and it gets me every time. The ending draws me in as though I were watching a real sporting event. The advantages this one has over Balboa-Creed I, other than the heart-stopping finish, are not only the advanced cinematography and better choreography (not to mention we get to see nearly all of the fight instead of just five rounds as in the first one). But it also wins points for the clever gambit Mick used that ultimately decided the fight: Rocky fighting right-handed before switching back in the 15th. Mick’s boxing acumen won this fight. Well, that and Apollo’s off the charts hubris. Chills on top of chills for this masterpiece. 1. Rocky IV—I don’t think any final match or game in any sports movie touches the war that was Balboa-Drago. 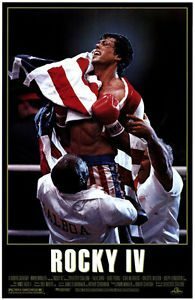 When Rocky cut the Russian in Round 2, the entire nation jumped out of its chair, took off its shirt and waved the American flag, chanting “U-S-A!” like Homer Simpson. It was electrifying. It was outrageous. It was beautiful. What a moment! And there is no sports plot twist like the Russians changing their allegiance to Rocky near the end of the fight. If you were alive in the 80s you know how significant this (literally) incredible and ridiculous moment was. It’s like if North Korea or ISIS today sent a basketball team over here and we started cheering for them over Steph Curry and LeBron James. It was as fantasy-level unbelievable as anything that happens in Narnia. And no one cared. Peak American cinema. Now to the film rankings. Note that my inability to keep the word count down on this, my favorite movie franchise of all time, means I have divided it up into two parts. Numbers 7 to 5 are today. The Top 4 will follow tomorrow. This movie is so hated, Stallone made Balboa 16 years later just because he was tired of hearing about how hated this movie is. I confess I genuinely like it. It clearly brings up the rear in the Rocky canon but the other six are all great to exceptional movies. It has great highlights to me: Rocky flashing back to Mick giving him the cufflinks, a hilarious Don King ripoff, Rocky standing up to Tommy at the end, Adrian ripping into Duke over and over, a classic Rocky-Adrian no holds barred conversation (contrast Adrian from this movie to the one in the original—THAT is character development), etc. And this movie is absolutely as quotable as any of the others. In my opinion, it was panned so universally in large part when it came out because Rocky doesn’t fight in the ring. It broke the formula and people weren’t ready for it. 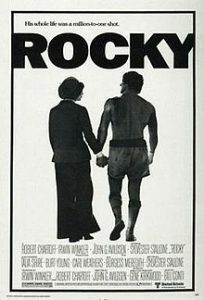 Also, this is the only Rocky movie where Rocky isn’t clearly a boxer or clearly a trainer and that made the plot a bit awkward. It was really too much of a mishmash of Rocky’s role in 1-4 and his role in Creed. And it just didn’t play well. For me, I do not deny it has weak aspects, notably that Sage Stallone and Tommy Morrison were terrible actors (May they rest in peace). Still, it’s a good movie and my wife and I watch it in sequence with the rest. And let it forever be known that having Elton John co-write and sing “The Measure of a Man” (a pretty unknown song that wasn’t played on the radio) over images from all five movies to that point to end gave us the best closing credits of all time. Large Men at Bar: Hey, Rock, you need help? Rocky: No guys, this ain’t no pie-eating contest. Rocky [to Tommy]: You knocked him down, why don’t you try knocking me down? Duke: IN THE RING IN THE RING TOMMY GUNN ONLY FIGHTS IN THE RING. Rocky: Yeah? My ring’s outside. Rocky [repeating Mick]: Yo Tom-my! I didn’t hear no bell. Mick [in flashback]: Get up…because Mickey loves ya. There is a walk down memory lane with Rocky and Paulie visiting all the places that meant something in the first movie, to honor Adrian’s death (which Stallone wrote in to give the movie more emotional punch, and it worked). Stallone even brought back little Marie, all grown up now and much more respectful to Rocky, and opening scene opponent Spider Rico. Still, the movie has some unique personality. Rocky’s passionate speech to his son Rocky, Jr. (played by the inimitable Milo Ventimiglia[1. And how much it meant to see Sly Stallone guest star on This Is Us and for Jack’s children to rave about how much their dad loved Rocky!]) about not making excuses is not something we saw in any previous movie. Same for Rocky’s diatribe to the boxing commission after they rejected him for a license. Stallone’s performance in Creed was better, but he really held nothing back here and nails these character-defining scenes. Like a man who at the time thought this was his last chance to play such an iconic character. I also adore Max Kellerman’s reaction to witnessing a “Rocky” fight for HBO, whom he works for in real life. I’m sure his reaction was not acting, but instead was a legitimate response of awe as a real life Rocky movie fan, and produced a fascinating moment where life and art collided. Let me tell you something you already know. The world ain’t all sunshine and rainbows. It’s a very mean and nasty place and I don’t care how tough you are it will beat you to your knees and keep you there permanently if you let it. You, me, or nobody is gonna hit as hard as life. But it ain’t about how hard ya hit. It’s about how hard you can get hit and keep moving forward. Italian food made by Mexicans ain’t that special. 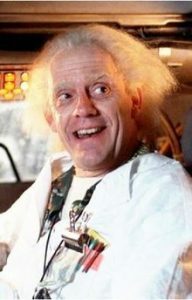 You one crazy old man. 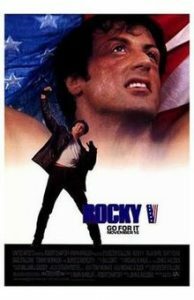 Let me say it again: Everything about this movie is over-the-top ludicrous…the cheesy 80s music, the Apollo dance number, Rocky climbing a mountain while training, the amount of steroid-enhanced bombs Rocky takes the head without dying, the fact that the Russians turned on Drago in the fight and began cheering for Rocky…and on and on. But that really doesn’t matter. This is a breathtaking, sublime 90 minutes of film. I know no other ranking on my list will cause as many howls of protests as putting this one fifth, which again, testifies to the depth of the franchise. And to show how razor thin the difference is in the top five, you could ask me to rank them again in six months and I might have this one #1 or #2. So why do I have it so low at this moment? Well, as many critics have pointed out, once you take out the training montages and that outrageous ending fight, this movie is like 23 minutes long. That’s barely an exaggeration. There is not much plot or character development to this installment and that is totally fine because this movie had the mammoth shoulders of three prior transcendent chapters to stand on in that regard. We knew the main players so it just fed us rapid plot points and twists like a Red Bull being injected straight into the entertainment veins: Big Russian wants to box, Big Russian kills Apollo, Rocky decides to fight Big Russian in Russia, Rocky wins. That’s it. That’s the movie. And it’s glorious from start to finish. I have watched Rocky 4 more than any of the others. It never ever gets old. If there is any movie that deserves a spot on, hilarious, fictional 30 for 30 on how its plot ended the Cold War, it’s Rocky 4. So that’s it. That’s the first half of the list. Go here for my ranking of the four greatest Rocky movies of all-time. Comments on these installments are welcomed below. The 80s had its problems but it gave us a lot of awesome things like Lunchables, the Transformers, trapper keepers, the Rubik’s Cube, and the list goes on. One of the best of the best (to some) is the excellent lineup of comedy movies throughout the 80s. Many of these are very well known and still loved. 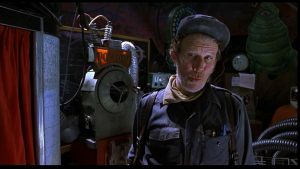 However, REO is horrified with the greatest of all horrors that several of our favorites have been forgotten, forsaken in the dusty, grimy back alley of cinematic history. Here are our recommendations of five great but relatively forgotten comedies from that decade. 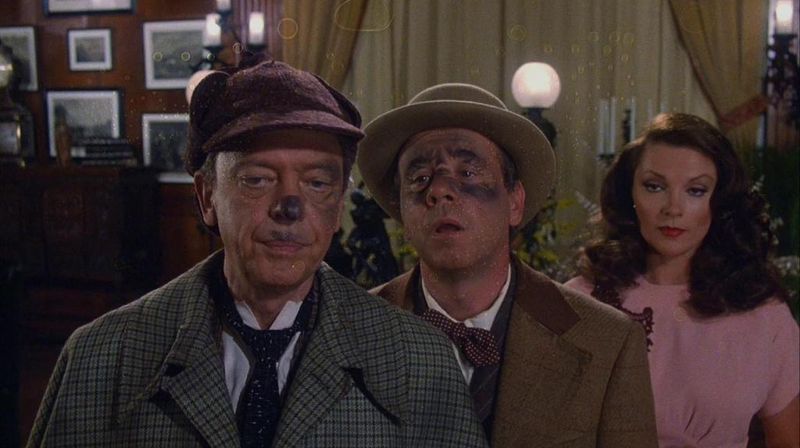 Don Knotts and Tim Conway were a legendary comedic duo, yet it seems this movie is far more under the radar than anything else they did. And that is a shame. Because it is hilarious from start to finish. Released in 1980, my family owned it on an old VHS tape and I watched it so much I had essentially every word of dialogue memorized as a child (which interestingly made my mother quite proud). It was such clever writing for that era and Knotts and Conway, as the bumbling Inspector Winship and Doctor Tart, brought the humor to life with once in a generation talent and chemistry. Fletch is widely considered one of the great comedies of the ’80s. It’s witty and razor sharp and Chevy Chase is at his sarcastic best. 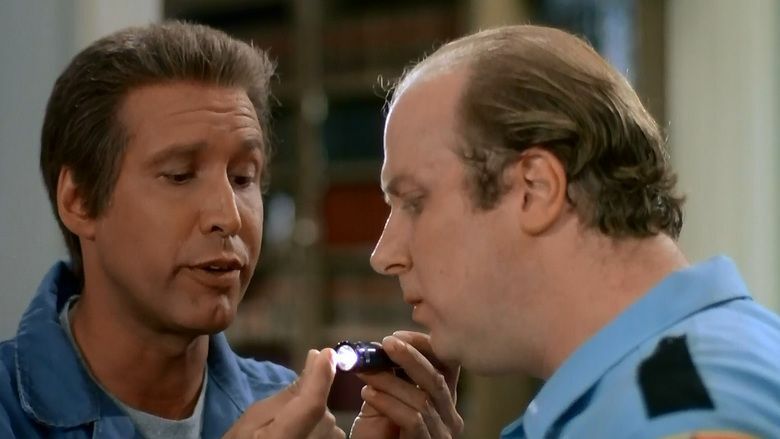 Fletch Lives, the sequel that came a few years later is widely derided as a pale imitation of its predecessor. I find that opinion to be ridiculous. No, Fletch Lives does not reach the highs of the original but it admirably captures its tone, style, and humor. Chase is given a chance to play a handful of memorable “characters” – Ed Harley and Claude Henry Smoot to name a couple. The supporting cast included screen legend R. Lee Ermey as a smiley, smarmy televangelist and Cleavon Little as Calculus Entropy, perhaps the best side character in either Fletch movie. Seriously, I would watch multiple films about Calculus. I’m pretty sure no movie of the 80s made me laugh more than this one did. In my circles, it is hard pressed to call it “underrated” because so many people I know love it. But it didn’t make a ton of money and it has a very mediocre rating on IMDB.com, so I think it fits in general. At a time when Chevy Chase, Steve Martin and Martin Short were all extremely funny actors, they brought it together for a ridiculous yet heartwarming masterpiece of comedic cinema. 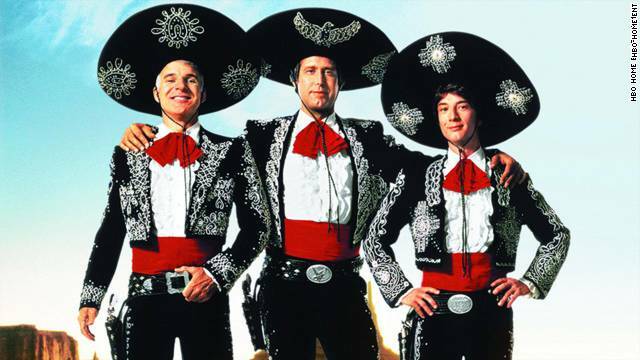 From the very opening where they hold out the first AH sound in “Amigos” for a stupidly and hilariously long time, to their discussion of what “infamous” means to their unforgettable “My Little Buttercup” song and dance in front of a terrified cantina, the Amigos make sure the laughs do not stop in this movie. Those are our picks. What are yours? Let us know in the comment section. Thanks for reading. Ask just about any kid what superpower they want most and they will choose the ability to fly. Ask any adult the same question and you will likely get the same answer. There is something wonderfully appealing about being able to fly. It’s why we took to the skies over 100 years ago. Movies have frequently attempted to capture the joy and excitement of flying. From Star Wars and its space battles to Top Gun and its over-the-top male bonding in the sky, movies have done their best to help us experience what it feels like to go airborne. Below, you will read (and see[1. All video clips are courtesy of the respective studios…Don’t sue us we aren’t making any money off of them!]) my five favorite flying scenes. A few disclaimers and honorable mentions before we get to the main list. First, I have not included any of the more “realistic” flying scenes – scenes where people are piloting airplanes or jets. Those can be fun but I think they mute a lot of the excitement we long for as children. Most kids want to fly, not fly in something. Second, as it will become more obvious below, I am drawn to scenes where the music and the mood capture me as much as what I am seeing on screen. Finally, I may have cheated a little on a few of these and violated my first point above. You’ll see what I mean below. 1. Iron Man – the first time Tony Stark flies in the Iron Man suit. It’s a fun, well executed scene. 2. Avatar – Neytiri goes flying on an Ikran. If Avatar excelled at anything, it was the visuals and James Cameron holds nothing back for this sequence. Seeing this in 3D was spectacular filmmaking. 3. The Neverending Story – Atreyu and Falcor fly over Fantasia. I have loved this movie since I was a child. The effects in this scene don’t hold up to today’s standards, but man did they transport me to a new world when I first saw this film. With all that said, here are my five favorites in no particular order. 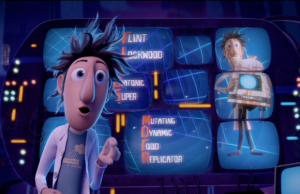 This scene is a perfect summation as to why Pixar films are so good. It’s the climax of the film and the filmmakers could have simply used that as an excuse to end the film with something huge. And in a way, it does end big, but everything that happens in this sequence happens to further develop the story and the characters. Buzz Lightyear and Woody have been butting heads since the moment they met. Buzz won the other toys over with his incredible “flying” demonstration early in the film. Yet, by the end of the film, he has come to terms with the fact that he is a toy and cannot fly. So what does Pixar do? It has Woody and Buzz working together to literally fly to the moving truck – and beyond. It’s action and excitement in service of the story and the characters. That is great filmmaking and it’s why Toy Story, and many other Pixar films, are so beloved all these years later. I realize that this film has been lost in the craze and popularity of the recent Marvel films. That’s a shame because Bryan Singer made a really good Superman film. This film serves as a sequel of sorts to Superman II – the one from the 80s. Superman has been gone from earth for five years. He left to see if he could find any signs of an intact Krypton. He returns to find that many people in the world, Lois Lane included, have moved on. This scene is his reintroduction to the world. For my money, this is the first time a film was truly able to capture Superman’s power, speed, and ability. The entire airplane rescue sequence is intricately constructed – with new obstacles popping up every few seconds. Besides the fantastic visuals, the music plays a vital role as well. Composer John Ottman did what most composers do not seem capable of doing: He checked his ego at the door and willingly weaved portions of John Williams’ classic Superman score with his own original score. You can hear the opening notes of the triumphant Williams Superman theme at the very end of the clip. The full theme is heard multiple times throughout the movie and that, coupled with Ottman’s original score, make for an awesome pairing. Speilberg was working on a level most other filmmakers only dream of when he made E.T. The Extra-Terrestrial. It’s one of my 10 favorite films and the climax is a big reason why. There is a sense of wonder and joy during the final chase – then flight – sequence it’s almost palpable. It’s perfectly staged by building up the tension a little at a time until you feel that something just has to give. And then the boys take flight on their bikes! I get chills every time I see it. I hate that this film seemingly got ignored when it released back in 2003. In a perfect world, this would be the definitive film version of this story. What draws me to this sequence–besides the pure joy and excitement demonstrated by the kids, and the impossibly chaotic and beautiful child imagined solar system–is the music. Again, if the music works for me, the film has a great chance to become a favorite. My reaction to this musical theme by James Newton Howard is hard for me to really explain. It hits me deep. It builds, it plays a bit, and then it explodes into the grand rendition of the Neverland theme. I saw this in a mostly empty theater when it came out and I was floored. There must have been dust in the air or something because my eyes were all manner of watery. Childlike wonder. That is all that really needs to be said about this sequence and this film. I enjoyed this film the first time I saw it. I liked the world, the story, and the music. Then my middle son fell in love with it. He was around six years old when he saw it for the first time at our house. Watching him watch this film is one of my favorite memories. I don’t know if I have ever seen a face as transfixed, as mesmerized, as awestruck as his face when he watched this first flying scene. I completely fell in love with the film once I saw it through his eyes – the eyes the film was meant to capture all along. That’s my list. I know there are dozens of other worthy scenes that I could have mentioned. I would love to hear from our readers. In the comment section below, tell us about some of your favorite flying scenes. Anything is fair game – even planes, jets, and all other flying machines. Thanks for reading. Today our staff discusses five more sports films that we love. You can read our first article in this series here. This is not a Top Five list; just five selections that impacted us deeply…as sports fans (most of us), moviegoers and human beings that love to be inspired. Maybe this one is too obvious. I’m not sure that matters that much to me. I love this movie. I love the story – even if the filmmakers took liberties in telling it. 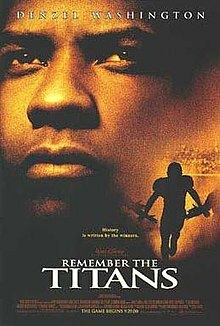 I love the performances, with Denzel doing what he does best, the young cast of football players/students bringing life and personality to the team, and to the unsung heroes of the film like Will Patton as the assistant coach. Everyone brings their A-game to the movie and it shows. The music by Trevor Rabin is earnest and epic which only serves to help everything mean a little bit more. This is a movie that calls its shot from the very beginning and unless you have never seen a sports movie before, you will know where it is headed. You anticipate the beats, the dramatic flourishes, and the building climax. None of that matters. This was Disney firing on all cylinders, perfectly delivering on their tried and true method. That might sound cynical of me. Trust me, it’s not. I unapologetically love this film even if it does pretty much exactly what you expect it to from the opening frame. It’s a movie built on moments, speeches, emotions, and inspiration. It sets out to tell a heartwarming and uplifting film and it pulls it off without a hitch. Remember the Titans is a Titan in the world of sports movies and deserves to be on everyone’s favorites list. “There’s No Crying In Baseball!” put this film on the map so to speak, but after about 10 viewings I can say that it is so much more than Tom Hanks at his comedic finest. It’s a perfect storm of untold history, tense family drama, riveting sports action and timeless storytelling that joins a pantheon of exceptional American screenplays. To me it is not just one of the best sports movies of all time, but one of the best films of any genre of all time. 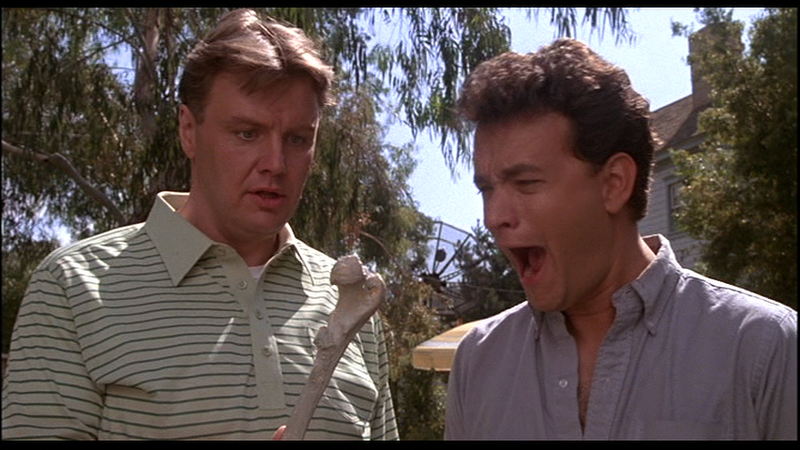 Hanks is his typical scene-stealing self. Gina Davis is great. Lori Petty is perfect as the insecure younger sibling (as the 4th of 5 children, I am fully qualified to make that call). Unheard of Megan Cavanagh, who doesn’t even have a picture on her wikipedia page, is unforgettable. Even modern punching bags Madonna and Rosie O’Donnell are good in their support roles. And they all have tremendous chemistry. Not to be lost is without of doubt my favorite Jon Lovitz performance ever, as the scout Ernie Capadino. Essentially 100% of what he says makes me and my mom laugh out loud, even after repeated viewings. To this day I can look at her and say “You see the way it works is that the train moves and not the station” and we will crack up. 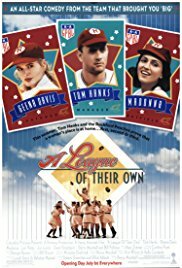 If a litmus test for movie grade is how rewatchable it is, A League of Their Own gets an A. Everybody get up, it’s time to slam now! A few years back, shortly after my wife Kate and I were married, we thought it would be great fun on a whim to hold a Space Jam party. We invited friends over, had some snacks, and watched the movie. You never really know just how well a movie will hold up over the years, because over time, a movie can seem so much better in your mind than it actually was. We took the gamble…and it held up well! 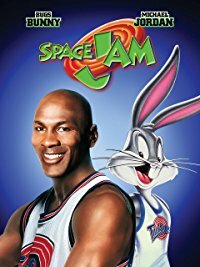 At lunch today, I asked my wife, “What is it that made Space Jam such a good movie?” She looked at me for a second and said, “What about it isn’t a good movie?” I had a hard time answering. On paper, I’d have expected the movie to be a failure. MJ teams up with the Looney Toons to challenge aliens for their fates over a theme park. What could possibly go wrong with an idea like that? Well, somehow director Joe Pytka was able to pull off movie magic. The story is compelling enough to make it fun. The music inspired everything from couple’s skates at the local roller rink (I Believe I Can Fly), to endless current-day internet remixes of the theme song by Quad City DJ’s. The star power is perfect for the time. This is right in the height of Jordan mania, after his first return to the NBA. As a teenager, I had a poster of him on my wall, slamming in it with his tongue out. Would I want to see him play against cartoon monsters? Psh, I could have watched him shoot free throws in practice and would have been enthralled. Bill Murray is there. Charles Barkley is there. Larry Bird is there. Heck, even Newman shows up. Yeah, it’s not the most epic movie by today’s standards, but it will forever be a classic in my mind, half court dunks and all. I hate MMA, or mixed martial arts. It’s one tiny step up from to-the-death, gladiatorial combat, and I honestly don’t understand or appreciate its appeal in the least. Which makes my reaction to Warrior, a movie about two brothers who are MMA fighters, so perplexing. 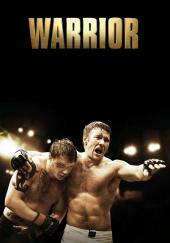 I never thought I would love a movie about MMA fighting, let alone like a movie like that, but Warrior defied my expectations and had me from very early on. The story is nothing groundbreaking – if you have seen any boxing movie or many sports movies for that matter, you can sort of guess where everything is going – but the execution of the story is what makes this film work so well. Nick Nolte, Tom Hardy, and Joel Edgerton give amazing performances as a father and his two estranged sons. I’ve never been a huge Nolte fan but he is incredible in this film playing a very damaged and broken father. Hardy is just pure intensity and he brings a real menace and danger to his character, but with just enough cracks in his facade to show that there is a lot more to him than just anger and passion. Edgerton plays the most “normal” role, but he gives his character so much depth that I hate to classify it as normal. The fight sequences are well shot – they are brutal and very effective. The film is shot low budget style which lends the film more realism and immediacy. The music is great as well, with a song by The National that closes the film perfectly. Warrior is first and foremost a movie about a broken family trying to find healing. That is what drew me in and what knocked down my walls. I was prepared to hate this movie due to my hatred of the sport it showcases. I was not prepared to fall completely for it. Millions know Sly Stallone from the Rocky and Rambo series. 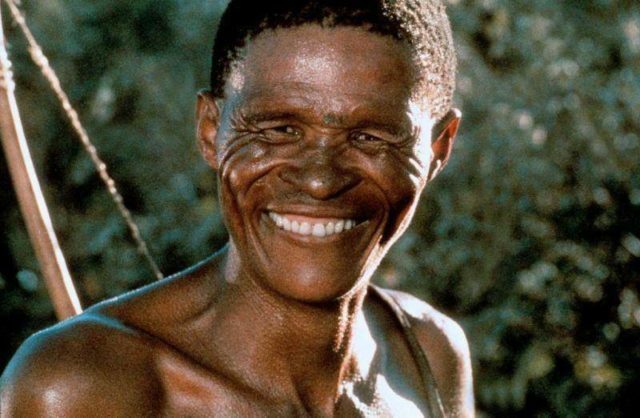 Far less remember him in this movie about an estranged father, his spoiled son and….arm wrestling? How many movies about arm wrestling are there? I don’t know, but when you’ve conquered the world as Rocky and Rambo, you get to take these risks. And while I may be in the minority, I think it yielded a reward. The superbly named Lincoln Hawk (Stallone) has the lovable humility of Balboa yet is still very much a unique character. And the journey he embarks on to earn back the love of his only son and to win an arm wrestling tournament (Really! It’s about arm wrestling!) is one I have enjoyed numerous times. A few years ago I began a tradition of having a “Man Movie Night” with other men at my church and this was the first one I showed. 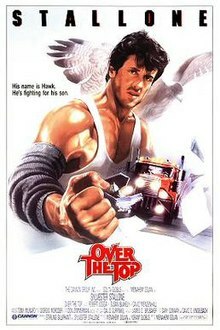 Because most people have seen Stallone’s other work and this is a hidden treasure to me. Yet despite its manliness, I think the heart of father-son reconciliation can appeal to most people. The movie has some faults for sure, like the arm wresting (arm wrestling!) tournament format of double elimination is not consistent, and the drama is at times pretty contrived, but Lincoln’s secret finger re-positioning weapon vs. Bull Harley in the final and all the memories he makes with with his son son along the way render all the flaws forgotten. Complete with a fantastic antagonist role by Robert Loggia and some of the best terrible wonderful cheesy 80s sports montage music ever, I adore this movie. There you have it. Five more sports movies we love. Our last list got some pretty strong feedback – both positive and negative. Hopefully this one will as well as we always enjoy a good back-and-forth with our readers. Use the comment section below to post your praise or ridicule of our selections today. Edna Mode’s Five More Reasons Why No Capes! 1. Dazzler was humiliated to superpowerlessness after being mercilessly laughed at and mocked for his flowery, fancy boy cape. Dazzler was born gifted with the power to shoot glitter and liquidified gold from his fingertips at will. To go with his sparkly theme, Dazzler had Edna create the most dazzling, breathtaking superhero suit of all time complete with a flowing, multicolored cape filled with lots of tassels, beads, and floral designs. One fateful day he encountered the evil Green Boys who were called that because they were green and boys. My friends, on that day they defeated Dazzler, not with knife or gun or any sort of supernatural weapon, but with killing words. It was his cape that did him in. The Green Boys mercilessly, callously mocked his cape until no shred of his former superhuman self remained. He was reduced to normalcy. He and his family moved to Detroit where he took on the miserable life of the miserable apprentice of a miserable party clown for the rest of his days. 2. Invector was distracted because he couldn’t find his invisible cape. Most of his super colleagues mistakenly assumed that he was among the new breed of modern capeless superheroes. This was not the case. 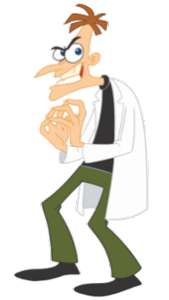 He had had Edna fashion him an ordinary invisible cape for the sole purpose of thinking, “hey, I’m awesome because I have an invisible cape. Plus, Wonder Woman will dig me with her invisible jet.” But alas the invisible cape was his undoing. In the midst of a battle he lost his cape and not finding the invisible article, his arch nemesis, Arabian Knight, was able to easily able to slay him with his gleaming laser scimitar. 3. Ghorozoid was tangled in his Guinness Book of World Records long cape. He had convinced Edna to create for him the longest cape in superhero history. This thing was an incredible 20 feet long. This meant that while on the job he had to keep running really, really fast so it wouldn’t drag. But although it was so impractical and high maintenance, he still wanted to have it for his uniform. It was his precious. One day he fell into the pursuit of the nefarious Maze Master who led him on a baffling chase here, there, up, down, all the directions you can think of, it was there. Pretty soon Ghorozoid was wrapped up in his cape like a moth in a cacoon. Took him a week to get out. Invector kindly spoon fed his colleague during this time. No, Ghorozoid didn’t die, but he left the profession in abject humiliation. I don’t know why he was called Ghorozoid. Quit asking so many questions. 4. The Rolling Stone fell off a cliff after his dangling cape’s technology malfunctioned and took rock form. A fateful nuclear accident in his laboratory gifted Dr. Edwin Magma with the ability to transform himself into a Rock-and-Roller made entirely of rock. From that day forward he was gifted with stone transformability, song, dance, and a golden electric guitar that shot lightning bolts. His signature move in the heat of battle was following a lightning bolt kill with a totally legendary guitar solo. To match his rock and rocking power, Edna fashioned a suit girded with a cape chock full of the latest igneous rock formation technology. Thus, when Stone took rocker rock form, so did his cape. To take this form he had but to hold aloft his golden guitar and summon the power of the Castle of the Rolling Stones. But very sadly for Rolling Stone, the cape short-circuited at a most inopportune moment. As he gazed for his foe from a high cliff, his caped dangled over the edge malfunction, and you know… To this day, Edna contends that it was not her suit that malfunctioned but user error by the Rolling Stone who was too busy shredding a totally rad guitar solo atop the high precipice to notice that he had inadvertently activated his cape’s rock powers. 5. OnomonoTia was blown away when the wind caught her billowing cape. It was as a very young girl that Tia Watson first felt a desire to rid the world of evil and darkness by filling this void with words that sound like what they mean. We’re talking things like snap, crackle, pop, whiz, bang, pow, etc. This desire grew and grew. She attended college, graduating with a degree in English. It was during this years that she became BFFs with a fellow English student who would one day become her arch nemesis, Princess Punctuatress. After graduation, the two assumed their secret identities and parted ways. They were only to meet again three years later on the shores of the Pacific for a last stand. Their battle was fierce that day my friends. There were “pows!” and “zaps! And “Whams!” aplenty. Commas and periods and semi-colons were flying everywhere. Suddenly a strong wind blew in from the east, collecting in OnomonoTia’s parachute-like cape and whisking her away, “Whooosh!” was her parting word of wisdom to the civilized world. “Exclamatioooon!” Cried Princess Punctuatress in victory and defiance mixed with some bit of sadness. Watson was soon lost to view, never to be seen again. Legend says she happily lived out her days on a mysterious island far, far away where the bees buzz, the duck’s cluck, the leaves rustle, and everything else sounds like what they mean. And she also married an islander named Chief Onomono. So if you intend to live a life of daring do, you are best to heed the very learned and experienced advice of Edna: NO CAPES!